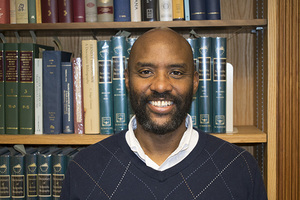 Bright Young Librarians: Curtis Small, Jr.
Our Bright Young Librarians series continues today with Curtis Small, Jr., Coordinator of Public Services for Special Collections at the University of Delaware. My title is Coordinator of Public Services for Special Collections. The main part of my job involves overseeing our exhibition program, our instruction activities, and our reference services. A number of my colleagues handle these tasks as well, but I’m the front line person. I monitor our reference queue, which receives inquiries from researchers everywhere, as well as requests from our faculty for instructional support. I may accommodate the requests myself, or pass them over to colleagues, as appropriate. My special collections colleagues and I regularly curate exhibitions in one of the four exhibition spaces in the library. It is my responsibility to make sure there are no gaps in our exhibition program, so I take an active role in planning. Also, I am a member of the project team for the Colored Conventions Project, an award winning Digital Humanities project that documents the largest African American advocacy movement of the nineteenth century. Before starting library school I got a Ph.D. in French literature from New York University. I wrote a dissertation examining the Haitian revolution for independence as represented in French and francophone Caribbean literature. My training at NYU did not emphasize book history, beyond a general knowledge of the importance of the printing press for early modern European literature. About seven years ago, an online course on the history of the book was my real introduction to the topic. Later, while working on my MLIS degree at Simmons GSLIS, I did an archival processing internship at the American Antiquarian Society, and a digital collections internship in Archives and Special Collections at Mount Holyoke College. As an MLIS student, I was not set on working in special collections, although I certainly enjoyed being exposed to rare and historic materials. When I went on the job market, it turned out that my general background in literature, along with my internships and teaching experience made me a good fit for the position I have at University of Delaware. I’m very happy things worked out this way! While my home institution has really wonderful collections, I must say that the most amazing items I have touched have been at the New York Antiquarian book fair. At last year’s fair I encountered presentation copies of James Baldwin’s two early novels Go Tell it on the Mountain and Giovanni’s Room. Both were inscribed to Baldwin’s mentor Beauford Delaney, an African American abstract painter who emigrated to Paris and died there in the late 1970s. Baldwin said it was Delaney who took him under his wing in Paris and taught him what it means to be an artist. In part, I learned French and went to study in Paris during grad school because Baldwin and other Black writers had done the same. Go Tell it on the Mountain is one of the most important novels to me, and finding a copy that reflected such an important artistic relationship was an experience I didn’t think could be topped. However, this year at the New York fair I came across a presentation copy of Cahier d’un retour au pays natal (Notebook of a Return to the Native Land ) by Martinican poet Aime Cesaire (b.1913 - d. 2008). This book length poem from 1939 is the founding work of the Negritude movement, in which poets from French colonies in Africa and the Caribbean forged a literary aesthetic that reflected their sufferings and aspirations in the face of colonialism. When I saw a copy of the Cahier in a Parisian dealer’s stall in New York, I thought how great it was to discover a first or early edition of a work I had read so many times. When he let me examine it, I realized this copy was inscribed by Cesaire to Andre Breton, the leading poet of French surrealism. In 1941 Breton left France to escape the Vichy regime. While in Martinique on his way to New York, he came across the literary journal Tropiques, produced by the young Cesaire and his circle. In a now well-known story, the two poets met and recognized each other as literary kindred sprits. The edition at the New York fair had Breton’s famous, laudatory essay on the Notebook, and a gorgeous poetic inscription from Cesaire to Breton. Many readers in the Francophone Caribbean see Cesaire as a literary father figure, and I came to see him that way myself while studying his work in graduate school, especially the Cahier. One of my dissertation chapters was devoted to Cesaire, in fact. I had to leave the fair in order process what I had just seen. I’ve always bought books, but more from the perspective of a reader than a collector. Since becoming a librarian I have begun purchasing signed or unsigned first editions in the areas of African American literature and African or Caribbean literature in French. My first “collector’s” purchase came during a Rare Book School course several years ago during “bookseller’s night,” a Thursday evening ritual. I found a copy of the 1922 English translation of the novel Batouala (1921) by Martinican author Rene Maran. The novel is unknown to most Americans today, but, like Cesaire’s Cahier, Batouala is a canonical work in Black francophone literature (and winner of France’s Prix Goncourt. Maran was the first Black writer to win the prize). Set in Africa, it sets out to portray the abuses that resulted from French colonialism. Batouala was widely read and admired by African American intellectuals during the Harlem Renaissance period. The copy I found was sitting on a shelf in a Charlottesville bookstore, surrounded by completely dissimilar items. And it wasn’t expensive! The idea that librarians read a lot is a stereotype with a basis in truth, I’ve found. So, besides reading, I enjoy music, singing and vocal music in particular. I studied voice while in undergraduate school (along with French) and have often sung in choirs over the years. A couple of years ago I started taking guitar lessons and I’m working on my skills at self-accompaniment. I also like to take in art exhibits and do yoga. During my course on the history of the book, I wrote a report on an illuminated Latin Vulgate Bible from the 14th century. Before then, I had never spent so much time with a volume as old as that. The experience brought me face to face with the fact that objects from the past outlive their creators and communicate to us in ways that are completely unique. That vellum, manuscript Bible captured my imagination and inspired me by its beauty. I have experienced many similar thrills since becoming a rare books librarian. As a teacher and scholar of literature, I was expected to know a great deal about a specific area. As a special collections librarian, I’m learning about about Irish poetry, the history of architecture, the Black Power movement, early astronomy, solar power, and many other subjects related to our collections. I love that. Currently, the Alice Dunbar Nelson papers are getting the most attention from researchers. Alice was married for a couple of years to Paul Laurence Dunbar, the first truly successful American American poet. Their marriage was troubled and short-lived, but she went on to have a long career as a writer, teacher, activist, newspaper columnist and more. The collection is large and contains a great amount of still untapped material. This includes her library, which features signed and unsigned first editions of books by Frances Ellen Watkins Harper, Countee Cullen, Charles Chestnutt, and other major literary figures. There are also first editions of works by Paul himself, many of which he no doubt gave to Alice. Last year, the 19th Century Women’s Writers Working Group met at here at University of Delaware. The meeting featured presentations and discussions of Alice’s work. Around that time, an issue of the scholarly journal Legacy was also devoted to her. A couple of years ago, Special Collections hired a postdoctoral fellow who has used the collection for research and teaching. This scholar’s work has included producing the first transcriptions of Alice’s reading journals, and developing digital humanities projects based on the reading journals and Alice’s scrapbooks. The first biography of Dunbar-Nelson is also in the works, and there are discussions around publishing one of her novelistic manuscripts for the first time. All these projects depend on access to the Dunbar-Nelson papers, and it’s very exciting to be connected to this work. An upcoming exhibition curated by my colleague Alex Johnston [profiled in Bright Young Librarians in 2014] is entitled “Things Are Not What They Seem: Forgeries and Deceptions From the University of Delaware Collections.” It will feature books, manuscripts, and works of art from our extensive collection of literary hoaxes and artistic forgeries. It begins on August 28th, and will run the length of the fall semester this year. For spring 2019, I am developing an exhibition on illustration and its relationship to narrative. I am collaborating with the chief curator of the museums here at University of Delaware. There will be books from Special Collections as well as prints and paintings bearing a relationship to the illustrations in the books. As a result of a recent reorganization, Special Collections is now a part of University Museums here at UD. This exhibition is the first to be co-curated by members of the two sections, and it will feature the largest number of Special Collections books ever displayed in one of the art galleries here on campus. My title is Coordinator of Public Services for Special Collections. The main part of my job involves overseeing our exhibition program, our instruction activities, and our reference services. A number of my colleagues handle these tasks as well, but I'm the front line person. I monitor our reference queue, which receives inquiries from researchers everywhere, as well as requests from our faculty for instructional support. I may accommodate the requests myself, or pass them over to colleagues, as appropriate. My special collections colleagues and I regularly curate exhibitions in one of the four exhibition spaces in the library. It is my responsibility to make sure there are no gaps in our exhibition program, so I take an active role in planning. Also, I am a member of the project team for the Colored Conventions Project, an award winning Digital Humanities project that documents the largest African American advocacy movement of the nineteenth century. Before starting library school I got a Ph.D. in French literature from New York University. I wrote a dissertation examining the Haitian revolution for independence as represented in French and francophone Caribbean literature. My training at NYU did not emphasize book history, beyond a general knowledge of the importance of the printing press for early modern European literature. About seven years ago, an online course on the history of the book was my real introduction to the topic. Later, while working on my MLIS degree at Simmons GSLIS, I did an archival processing internship at the American Antiquarian Society, and a digital collections internship in Archives and Special Collections at Mount Holyoke College. As an MLIS student, I was not set on working in special collections, although I certainly enjoyed being exposed to rare and historic materials. When I went on the job market, it turned out that my general background in literature, along with my internships and teaching experience made me a good fit for the position I have at University of Delaware. I'm very happy things worked out this way! While my home institution has really wonderful collections, I must say that the most amazing items I have touched have been at the New York Antiquarian book fair. At last year's fair I encountered presentation copies of James Baldwin's two early novels Go Tell it on the Mountain and Giovanni's Room. Both were inscribed to Baldwin's mentor Beauford Delaney, an African American abstract painter who emigrated to Paris and died there in the late 1970s. Baldwin said it was Delaney who took him under his wing in Paris and taught him what it means to be an artist. In part, I learned French and went to study in Paris during grad school because Baldwin and other Black writers had done the same. Go Tell it on the Mountain is one of the most important novels to me, and finding a copy that reflected such an important artistic relationship was an experience I didn't think could be topped. However, this year at the New York fair I came across a presentation copy of Cahier d'un retour au pays natal (Notebook of a Return to the Native Land ) by Martinican poet Aime Cesaire (b.1913 - d. 2008). This book length poem from 1939 is the founding work of the Negritude movement, in which poets from French colonies in Africa and the Caribbean forged a literary aesthetic that reflected their sufferings and aspirations in the face of colonialism. When I saw a copy of the Cahier in a Parisian dealer's stall in New York, I thought how great it was to discover a first or early edition of a work I had read so many times. When he let me examine it, I realized this copy was inscribed by Cesaire to Andre Breton, the leading poet of French surrealism. In 1941 Breton left France to escape the Vichy regime. While in Martinique on his way to New York, he came across the literary journal Tropiques, produced by the young Cesaire and his circle. In a now well-known story, the two poets met and recognized each other as literary kindred sprits. The edition at the New York fair had Breton's famous, laudatory essay on the Notebook, and a gorgeous poetic inscription from Cesaire to Breton. Many readers in the Francophone Caribbean see Cesaire as a literary father figure, and I came to see him that way myself while studying his work in graduate school, especially the Cahier. One of my dissertation chapters was devoted to Cesaire, in fact. I had to leave the fair in order process what I had just seen. I've always bought books, but more from the perspective of a reader than a collector. Since becoming a librarian I have begun purchasing signed or unsigned first editions in the areas of African American literature and African or Caribbean literature in French. My first "collector's" purchase came during a Rare Book School course several years ago during "bookseller's night," a Thursday evening ritual. I found a copy of the 1922 English translation of the novel Batouala (1921) by Martinican author Rene Maran. The novel is unknown to most Americans today, but, like Cesaire's Cahier, Batouala is a canonical work in Black francophone literature (and winner of France's Prix Goncourt. Maran was the first Black writer to win the prize). Set in Africa, it sets out to portray the abuses that resulted from French colonialism. Batouala was widely read and admired by African American intellectuals during the Harlem Renaissance period. The copy I found was sitting on a shelf in a Charlottesville bookstore, surrounded by completely dissimilar items. And it wasn't expensive! The idea that librarians read a lot is a stereotype with a basis in truth, I've found. So, besides reading, I enjoy music, singing and vocal music in particular. I studied voice while in undergraduate school (along with French) and have often sung in choirs over the years. A couple of years ago I started taking guitar lessons and I'm working on my skills at self-accompaniment. I also like to take in art exhibits and do yoga. As a teacher and scholar of literature, I was expected to know a great deal about a specific area. As a special collections librarian, I'm learning about about Irish poetry, the history of architecture, the Black Power movement, early astronomy, solar power, and many other subjects related to our collections. I love that. Alice was married for a couple of years to Paul Laurence Dunbar, the first truly successful American American poet. Their marriage was troubled and short-lived, but she went on to have a long career as a writer, teacher, activist, newspaper columnist and more. The collection is large and contains a great amount of still untapped material. This includes her library, which features signed and unsigned first editions of books by Frances Ellen Watkins Harper, Countee Cullen, Charles Chestnutt, and other major literary figures. There are also first editions of works by Paul himself, many of which he no doubt gave to Alice. Last year, the 19th Century Women's Writers Working Group met at here at University of Delaware. The meeting featured presentations and discussions of Alice's work. Around that time, an issue of the scholarly journal Legacy was also devoted to her. A couple of years ago, Special Collections hired a postdoctoral fellow who has used the collection for research and teaching. This scholar's work has included producing the first transcriptions of Alice's reading journals, and developing digital humanities projects based on the reading journals and Alice's scrapbooks. The first biography of Dunbar-Nelson is also in the works, and there are discussions around publishing one of her novelistic manuscripts for the first time. All these projects depend on access to the Dunbar-Nelson papers, and it's very exciting to be connected to this work. An upcoming exhibition curated by my colleague Alex Johnston [profiled in Bright Young Librarians in 2014] is entitled "Things Are Not What They Seem: Forgeries and Deceptions From the University of Delaware Collections." It will feature books, manuscripts, and works of art from our extensive collection of literary hoaxes and artistic forgeries. It begins on August 28th, and will run the length of the fall semester this year. For spring 2019, I am developing an exhibition on illustration and its relationship to narrative. I am collaborating with the chief curator of the museums here at University of Delaware. There will be books from Special Collections as well as prints and paintings bearing a relationship to the illustrations in the books. As a result of a recent reorganization, Special Collections is now a part of University Museums here at UD. This exhibition is the first to be co-curated by members of the two sections, and it will feature the largest number of Special Collections books ever displayed in one of the art galleries here on campus.